Nick DeNardis - who has written 26 posts on .eduGuru. Nick is the Associate Director of Web Communications at Wayne State University by day. 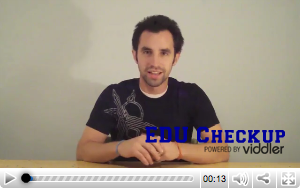 By night he hosts the video blog EDU Checkup where he reviews higher education web sites live. Nick is an active member of the higher education web community and is an officer of Refresh Detroit, a group of web professionals whose goal is to promote web standards, usability, and accessibility. Advertising your institution on a number of sites via text, banner, or even pre-roll videos ads has become ever more popular as the shift from print to digital takes hold. There is one downside to this change though, loss of context control. Making a Web site flexible is an art. Not only does your site have to look good cross browser on screen but also scale down gracefully for a mobile phone or print. Last week myself, Michael Fienen and Karlyn Morissette had the privilege of speaking at the HighEdWeb 2009 Conference. I can’t explain how great it was to see so many higher education web professionals, I feel humbled being around so many awesome people doing great things. University web designers have a tough enough job as it is, juggling users needs while pleasing committees and numerous other stakeholders. Doesn’t matter if your web office has complete control or just influence, using a grid can make completely unrelated sites look uniform. In this short article I’m going to attempt to explain the differences, advantages and struggles of using HTML5 in its current form. It has a lot to offer but browsers still have a little ways to go for fully fledged public adoption. Your Faculty: Do you hide or praise them? Something that gets overlooked quite a bit in the web process is the content you don’t control, your faculty. Faculty are an intricate part of every university and essential to any graduate student, especially Ph.D. looking for a program. Promoting your faculty can be almost as important as promoting your programs. Are you human? is CAPTCHA needed? Some Alternatives. Do you have naked HTML out there? A large majority (I hope) of university sites are using a content management system to control the thousands of pages which make up a single university web presence. I am willing to guess that multiple people are editing the content on those pages and they are using some sort of WYSIWYG editor. Over the past few weeks I’ve been thinking about web site redesigns and what a ridiculous process it can be in higher education. Even a simple site (40-100 pages) at my University takes anywhere from two months to a full year depending on how many people are involved.